Orquesta Joven de la Sinfonica de Galicia, Alberto Zedda (conductor). A normal CD review of this opera release by our Italian-speaking specialist reviewer will be available early next year. Meanwhile some thoughts for discussion about Naxos's presentation with suggestions how it might be improved. Francesco Cavalli (1602-76) presented regular opera seasons in Venice, their popularity growing following the pioneering scores from his mentor, Monteverdi. 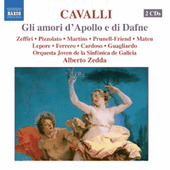 Gli amori d’Apollo e di Dafne (taking the same story that Richard Strauss later used for his Daphne) was premiered in Venice, 1640. I was particularly attracted to explore it because the librettist was Busenello, the same as for Monteverdi's Poppea, which boasts one of the finest opera libretti I know. The music is mainly in recitative and arioso, with "noble declamation central in Gli amori", heightened in episodes such as the lament by Procris, "one of the most intense and moving in the history of music" (Federico Agostinelli). How can listeners to the Zedda recording approach this? If they are not native Italian speakers, then with difficulty and grave limitations, those just a little decreased by Naxos for people who listen to music on their computers. The introductions by Agostinelli and Alberto Zedda are voluminous, albeit in very small print which tests eyesight beyond the limit for many of us. And there is a synopsis of the scenes by Keith Anderson; all those translated into German. Furthermore, the Italian libretto (with track numberings, can be accessed and, if you wish, printed from http://www.naxos.com/sungtext/pdf/8.660187-88_Cavalli_texts.pdf (28 pages). The importance of the text in opera of that time cannot be overestimated. Zedda, discussing his elaboration of the rudimentary score, says that everything has to work around the voice to allow any textual nuances to shine through; the singers must draw out of the text the light and shade that makes it live and breathe - - master the prosody of the language and bring strength and dramatic weight to the words, expressing their full evocative value and symbolism. I tried following parts of the 1st Act with the Italian text on the computer monitor screen and the synopses next to it. Occasionally one can spot correspondences between summary and sung text, but that is hard and unrewarding work, and after not long, I gave up. I doubt if anyone will sustain that exercise for two and three-quarter hours? The Naxos teams must have discussed how to present their recordings, and their provision of online texts (especially for song discs) is a substantial step towards listener friendliness. But a radical re-think is called for, and not only by that company. This Gli amori booklet has 28 pages, including the glossy cover page (illustrated); sometimes a few more are squeezed in. The six sheets folded inside are also glossy are not quite so thick. They are limited by Naxos's continuing aspousal of the original "jewel cases", which more enterprising other companies have abandoned (I do not know the relative costs of the alternative formats?). Some other companies have adopted strong thin non-glossy paper, which allows for more print space. Many CD producers (and concert promoters) allow counter-productively over-long artist CVs (over six pages for the numerous singers here (who reads them?) plus most of a page (better warranted) for the interesting Youth Orchestra and its conductor. Clear scope for economy there! The online Italian text is compressed to the left hand side of each of the 28 pages. There is plenty of room for a parallel translation in one foreign language (English would seem the most appropriate in view of likely international sales?) but, failing costs justification for that - far the best solution - it would take Naxos's web staff no more than a few minutes to add Anderson's English synopsis in parallel positions alongside the online libretto. Il sereno del Ciel turbi col pianto? Se innova pioggia si distilla il Sole? Dimmin cortese Apollo, i tuoi cordogli. E qual'e la cagione di tanto tuo dol ore? T'ha si malconcio o sconsolato Apollo? Che smeraldeggia nelle belle frondi? Con armi di belm piagommi il seno. E toglier a miei baci . Con le radici della vita mia. I raggi mandero sovra di lei. Saro geloso ancor de'raggi miei. Se dagl'occhi non t'esee in torbid'onde? Piangete erbe, ombre, antri, aure, augelli e fronde. La memoria vivra d'etemi amori. Frattor de' rami miei, mentre son pianta. Se non le ninfe imbelli, almen Ie piante. Delle mie proprie mani, ohime, ferita. Se non merta pieta, svellasi omai. Patiboli e torture appresta amore. Te come amante, e come Sole adoro. D'esser scritte in caratteri di stelle. Della sua Dafne non si scordi il Sole. A corone sl altere e peregrine. Stimo il caro diadema aver d'allori. L'allor andar lassu seria ben degno. A chi ci nutre in sl beato ardore. Sempre Amor, Epan, Dafne e Apollo. Qui la macchina s'abbassa per ricevere Apollo e con ­ durlo in Cielo. that so disturb the Heavens. tells Pan that the cause is love. and how she avoided his kisses by turning into a laurel; he is jealous of the wood, where roots can mingle with the roots of his beloved, jealous of the breezes that kiss her evergreen leaves, and when he is in Heaven he will be jealous of his own rays that he sends down on her. He asks Pan why he does not weep, and calls on flowers, shades, caves, breezes, birds and leaves to lament. Pan tells him to take from the tree and make a garland for his fair hair, adorn his lyre and be consoled that now the memory of eternal love will live on in immortal laurels. Apollo was the enemy of her honour when she was a woman and breaker of her boughs now she is a tree. She begs pardon at least for the humartity entombed there and if nymphs are unwarlike, at least he should spare the tree. Apollo is distraught, having injured the precious trunk. He hears the voice of his beloved, struck by his own hands. Apollo seeks her pardon and tells her of the suffering love brings him. Dafne tells him that even if her boughs do not deserve pity, it should be known to the world that she gave him no offence. Dafne is satisfied and repents of her cruelty; she bows before him with her leaves, branches and roots, declaring, in the language of humans and of laurels, that she adores him as a lover and as the Sun. Pan thinks these words are worthy of being written in tbe stars. She bids friend Apollo farewell, no longer able to speak, telling the Sun not to forget her. Apollo will bind Iris locks with the leaves of his fair Dafne, a crown better than all, the garland of laurel. Pan tells her that every earthly, every heavenly form, bows down before her; her divine beauty will be sung through the forests, worthy of inclusion in the Zodiac. Apollo and Pan together sing of the eternal light of love, Heaven ever to resound with Amore, Pan, Dafue and Apollo. The machine descends to take Apollo up into Heaven.